YOU DON’T HAVE TO BE IN NIGERIA TO PARTICIPATE. Competition runs from 30th November to 10th December 2015. 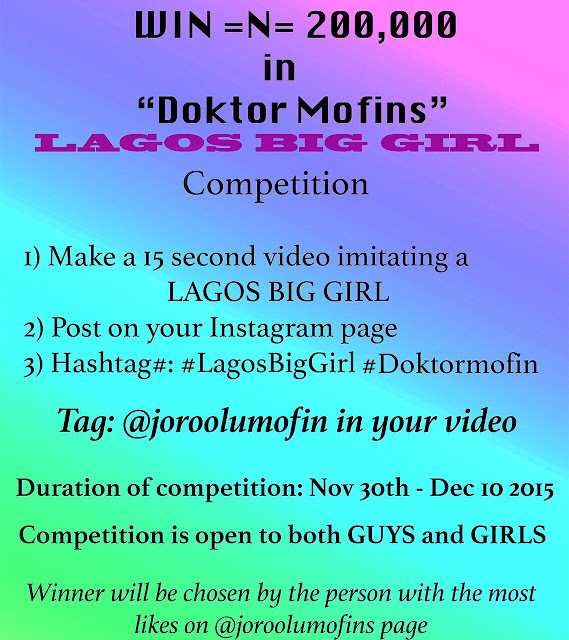 He has now gone further to turn the “Lagos big girl” series into a competition/giveaway with a price money of N200,000 for the winner. Adejoro- “Based on the Acceptance of the “Lagos Big Girl” series and how far and wide it went I’ve decided to get other people involved by doing a giveaway with the winner taking a price of 200,000 Naira at the end of the competition. This competition is not about money alone because some people may Shy away and say I’m not hungry or looking for money. I’d like to encourage everyone to get involved or tell a friend to get involved in the competition, you never know where it may go. I believe it’s a form of youth empowerment because our generation is filled with vibrant, energy and resourceful individuals who need a platform like this to show (1) Acting Skills (2) Makeup Skills (3) diversity (4)comedic genius, amongst others“.